I'm not a violent person but I feel like making mincemeat of someone. Or some thing, be it animal, vegetable, or mineral. A quick haymaker to the gut, then a bunch of piercing jabs, the old one-two, a little bit of chop-chop, a couple of suplexes, and you've got a pile of mincemeat. With maybe some pants on the floor where his feet used to be. A picture that comes to me is an old professional wrestler, stomping around the ring, yelling for the dressing room for his enemy to come out, to stand before him. Then he grabs the microphone and they're face to face, while he yells and spits his way to a rumble, "I'm going to make mincemeat out of you!" The enemy can stand it no longer and looks to the crowd, always ready for blood. He turns his back and WHACK! ... there's a chop to his neck from behind. 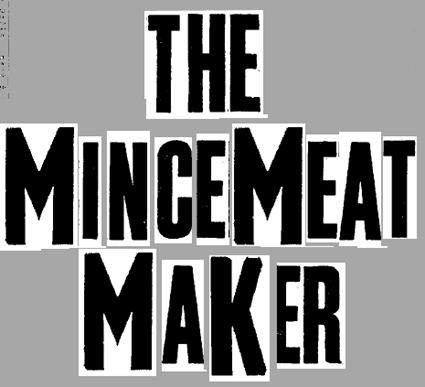 The Mincemeat Maker is at work, making mincemeat! This is the law of the jungle, you're either making mincemeat or being made mincemeat out of. There doesn't seem to be any middle ground. The middle ground is where we put the mincemeat. A lot of people die in the course of a day. They're mincemeat. But the rest of us somehow stay alive. We're not mincemeat, yet, in that ultimate sense. So far I've done pretty well, I'm not mincemeat. Still, you wake up, and bellow outside about making mincemeat of someone. Like I said at the top, I'm looking around, scouting the horizon, I want to make mincemeat of someone!